Amazing and most original dress ever, by the one and only Paco Rabanne. Dating from the 2000’s, this dress is completely black with PVC round cutouts at the waist, back and also PVC hem. Definitely a statement dress and a stunner. Make an entrance with it and enjoy being the envy. No words to describe how much I love this piece, and no doubt that you will too! 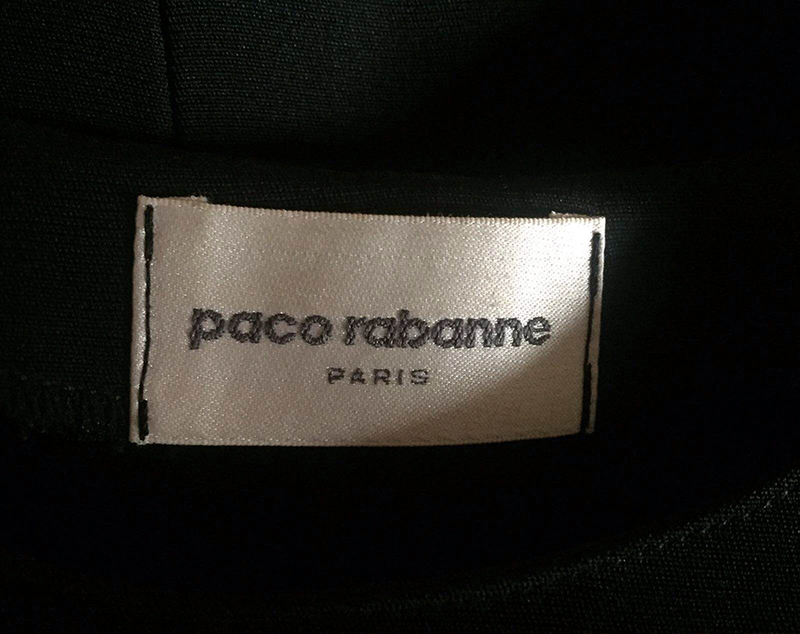 About the designer: Paco Rabanne was born in Spain, 1934, but his family moved to France during the Civil War. He studied architecture in Paris, although he soon ventured into the world of fashion. His earliest contribution to fashion were his bold plastic jewellery and buttons which he sold to Balenciaga, Dior and Givenchy. In 1965 he started his career as a designer by presenting a collection of 12 contemporary dresses which he called “the Unwearables”, including his first plastic dress. In 1966 Paco Rabanne opened his store, where he earned international repute for his metal-linked plastic-disc dresses and jewellery made of plastic in primary colours. Paco Rabanne’s dresses and flamboyant designs stole the show in Paris and became known as “l’enfant terrible” of the 1960’s French fashion world. – Unsized and no composition tag. – Bought in Paris, from a high end vintage collector. May 2014.